Through this self-described “listening tour,” Rudin-Luria heard existing concerns, support for Cleveland and its Jewish community, and ideas for the future. She wanted to take the pulse of the community, understand where it sits now to help move it forward during her tenure. Rudin-Luria was named the fifth president in the 115-year history of the Jewish Federation of Cleveland, succeeding Stephen H. Hoffman, who held the position for nearly 35 years. Four months after taking the helm, Rudin-Luria listed increasing vibrancy of Jewish life and focusing on security throughout the community among her top goals as president. How people relate to being Jewish is changing, said Rudin-Luria, explaining part of the Federation’s evolution is making sure it’s set to be able to respond to those changes through its partner agencies and relate to the five generations of Jews the organization serves. A key part of that increasing vibrancy is synagogue life, which she sees as growing through the Federation’s Campaign for Jewish Needs and the Jewish Education Center of Cleveland in Cleveland Heights. Another area is Jewish education, where she said she sees families who might not have pictured themselves as day-school families enrolling their children in classes after getting a taste of the schools through early childhood education. “Whether it’s a synagogue or a day school or another event or institution, we want every door to be the right door someone walks in, so that any door someone comes through, we want them to feel invited to participate and engage in Jewish life in the way that it works for their family,” she said. In the wake of the Tree of Life Congregation massacre Oct. 27, 2018, in Pittsburgh, the Jewish Federation of Cleveland announced security funding would increase to $3.3 million for the next fiscal year, almost $2 million more than in 2018. Yet, as security increases in the 43 area buildings that contain Jewish institutions, Rudin-Luria doesn’t want Jewish Cleveland to be defined by its security. The Campaign for Jewish Needs is a key factor in growing the vibrancy of Jewish life and increasing security, among other needs throughout the community. The fundraising is necessary to be able to support a “high-quality” community, which Rudin-Luria said can’t happen without raising money. As the community grows, a new group of leaders is emerging. Rudin-Luria has spent time with young leadership, a demographic she quipped she’s still technically a part of for the next few months. During these times, she’s learning how they’re able to stay diverse, coming from all walks of Jewish life, and about their openness to new and different experiences. Working with different parts of the community is of interest to Rudin-Luria. 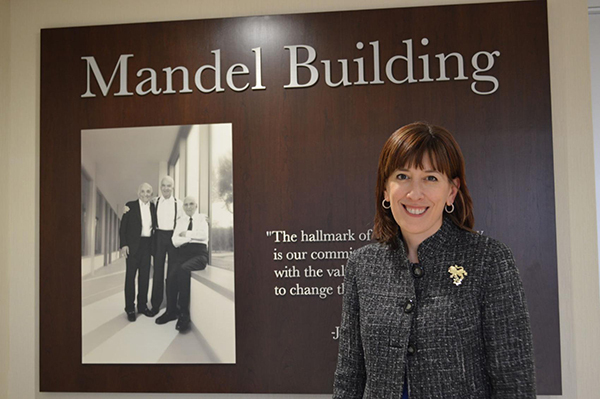 Prior to her role as president, she worked on the creation of jHUB, which connects interfaith families to Jewish life, as well as the creation of the Cleveland Chesed Center, which opened in March 2016. Rudin-Luria, who joined the Federation in 2001, previously served as the senior vice president and chief strategy officer, a role in which she oversaw the Federation’s strategic planning, community development, allocations, governance and marketing functions. Becoming president was something she wanted. Around the time she became planning director in 2004, Hoffman and Joel Fox, former executive vice president of the Federation, both noted the tendency of a planning director going on to become a federation executive, though not necessarily in Cleveland. “I had thought about whether or not I would want to run a federation one day, and the more time I spent in Cleveland and the more I got to know the Cleveland Jewish community, the more I wanted to be here,” she said. She began her career at UJA-Federation of New York City, the largest local philanthropy in the world, as a project coordinator. When Rudin-Luria and her husband, Rabbi Hal Rudin-Luria of B’nai Jeshurun Congregation in Pepper Pike, were looking for a community that would be right for them, they passed over Palo Alto, Calif., and Westchester, N.Y., and settled on Cleveland. Working for Hoffman was a deciding factor in choosing Cleveland. When they first moved to Cleveland, their plan was to live here for three to five years. After seven years, she stopped pretending they were leaving. The couple lives in Pepper Pike with their two sons, Jacob and Ari. Rudin-Luria said becoming president of the Federation and having an opportunity to work with its leadership and the community to impact Cleveland and the Jewish world is the greatest privilege. At the end of her tenure, she hopes to be remembered as someone who was able to bring the community together during trying times.